Stephanie Plum's got a one-way ticket to trouble... After a holiday from hell, Stephanie's heading back to New Jersey and life as a bounty hunter feeling worse than before. And that's before she finds out the man in the seat next to her was brutally murdered on their layover, and she may hold the key to his death. Janet Evanovich is one of the most successful of several highly successful female American authors who've shifted gears from romance writing to crime and mystery writing over the course of their authorial careers. With more than 200 million copies of her books in print, Evanovich's long-running mystery series starring department store lingerie buyer-turned-accidental bounty hunter Stephanie Plum is loved by millions of readers, and regularly hits #1 on the New York Times bestseller lists. I've heard from long-time fans and other reviewers that the books become a bit 'samey' after a while, but as I've only read three of the 24 titles so far, things are still relatively fresh for me. I enjoyed this read. It's a fun, fast read that doesn't take itself too seriously. While it doesn't rise to the heights of many of Evanovich's 'big name' bestselling peers in the crime world, I can see why the series is so popular. Stephanie Plum is an intriguing character, pretty distinctive, and easy to follow along with on her mishaps and adventures. There's plenty of humour threaded throughout, keeping the overall tone light and the darkness of some of the serious criminal acts at arm's length. I tore through the book quite quickly, and usually had a smile on my face throughout. 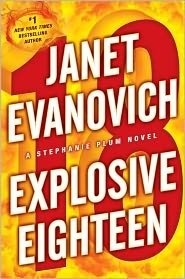 In EXPLOSIVE EIGHTEEN, Plum is returning from a Hawaiian holiday, keeping her friends and readers in suspense about the whole story of what really went on there. She's quickly distracted by plenty of action 'back home', as her seat-mate on the flight home disappears and is later found dead, her workplace at the bail bonds is blown up, and her and eccentric pal Lula still have bail bonds to catch though. An interesting name crops up in their sights, Plum's arch-enemy Joyce Barnhardt. There's plenty of action and lots going on in EXPLOSIVE EIGHTEEN. Evanovich slips in some nice zingers and funny moments, subtly at times, to keep a smile on readers' faces as the pages whir. Things are interesting and slightly off-kilter, in a fun way - this isn't a series that focuses on tonnes of characterisation or social commentary. It's pure entertainment, a light and fun read with plenty of action and some interesting characters that you could very well want to revisit again and again.